The finished dish - lots of pretty bites on a plate with some interesting accompaniments. 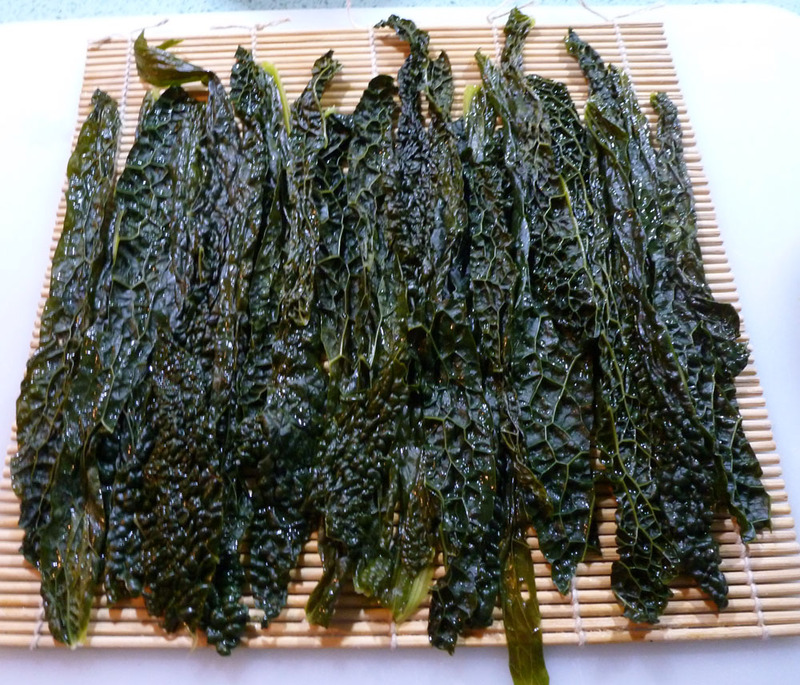 Firstly, the ‘nori’ substitute – Cavallo Nero (henceforth known as ‘cavallo nori’). 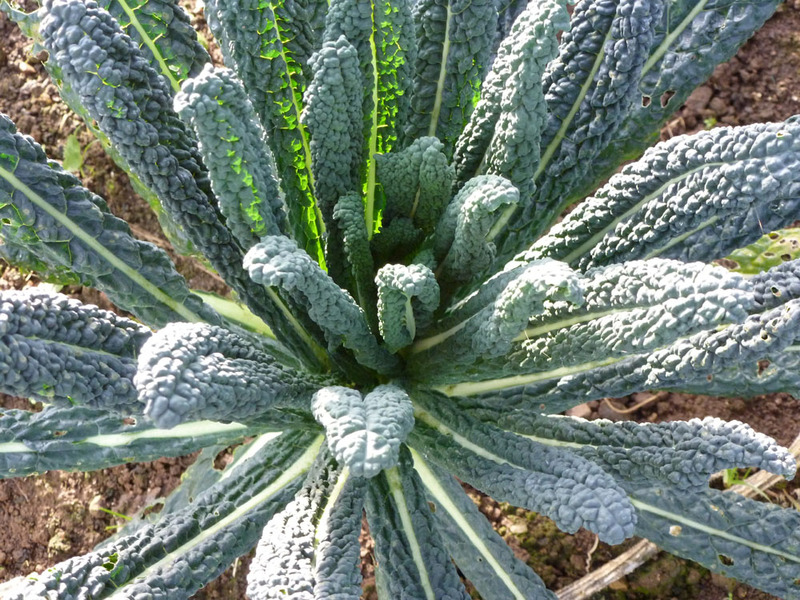 Kale - 'Cavallo Nero' - fresh from the allotment! Cut the central veins from the cavallo leaves. Salt the strips quite heavily, to try to emulate a seaweed flavour, and steam until tender. They need to be very tender – no ‘al dente’ here! Set aside to drain and cool. Cook the rice. The ‘absorption method’ is very good: weigh 200 g of pudding, (or risotto or sushi rice but NOT long grain) into a bowl, add salt, then – still on the scales – top up with just under 500 g of water. Cover with a plate and microwave for 3 minutes. Give it a good stir and allow it to stand while you get on with the rest. Cut all the vegetables into 2mm x 2mm sticks. You need to cook the parsnip and carrot sticks. Simmer them gently in the cider vinegar and 1 tbsp sugar. 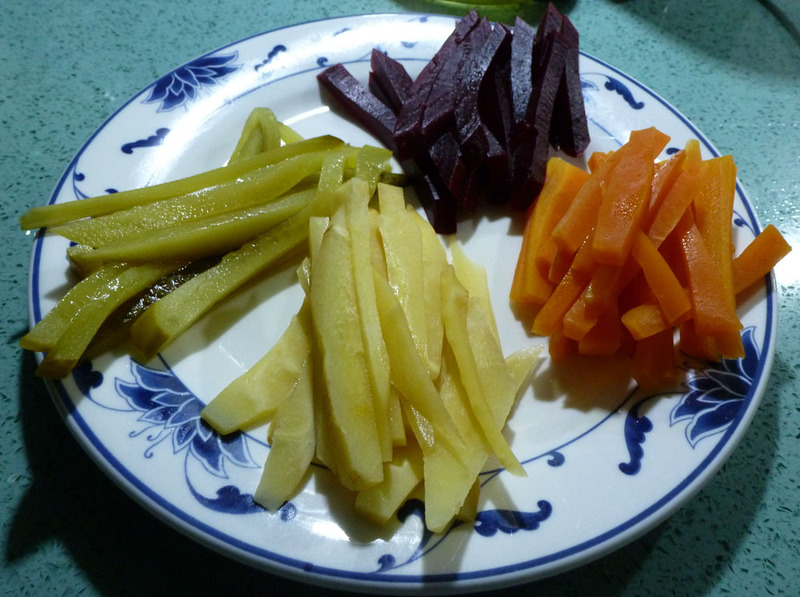 Sushi ingredients - pickled veg of distinctly different colours, to create an attractive cross section. It's a bit like 'Tunbridge ware'! Check the rice. Give it a further vigorous stir to bring out the starch and make it good and sticky, and micowave for a further 2 or 3 minutes to finish absorbing all the water. Allow to cool. Make a thin omelette by beating the egg with a dash of soy sauce and frying in a little sesame oil. Allow to cool, blot the surplus fat from the omelette with kitchen roll and trim it down to a square. Now, all ingredients prepared, you’re ready to roll! 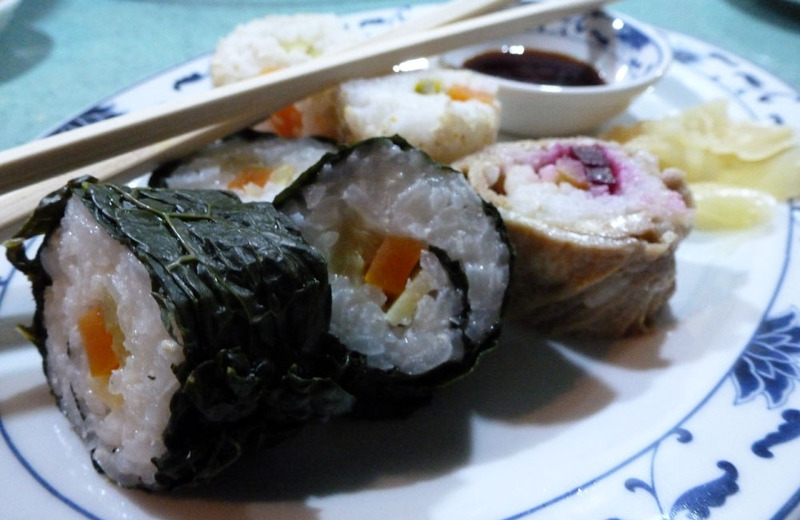 You’ve got enough rice here to make three different sorts of sushi – the ‘nori’ rolled one, one wrapped in an omelette and one rolled in sesame. Arrange the nori on the rolling mat to make a square sheet. Pat a third of the rice onto the bottom third of the nori. It’s important to get the rice even, and I use a teaspoon dipped in water to trowel it into shape! 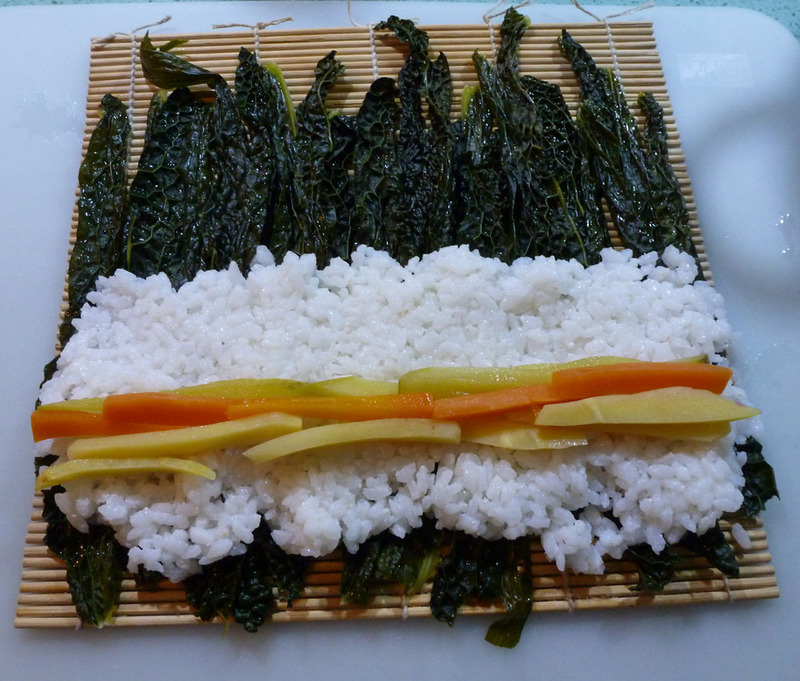 Arrange the vegetable sticks along the centre of the rice. Roll up, firmly squeezing the rice as you go. Wrap in cling film and chill for several hours. Make the other two rolls the same way. 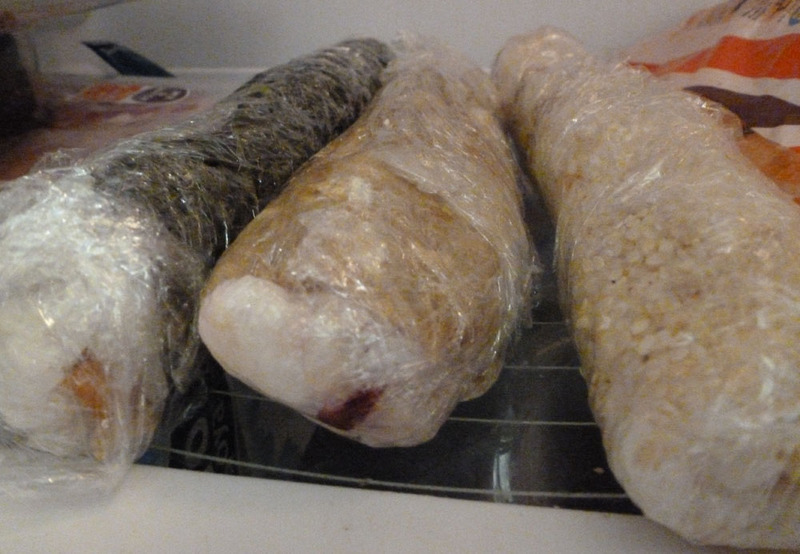 The sesame coated one doesn’t have a supporting sheet of nori or omelette for the rice, so you may like to lay it on cling film (without rolling it into the body of the sushi!). I tried assembling it straight onto the naked mat and it worked very well. The real treat of this recipe is that you can make it well in advance, then cut it into neat sections just prior to serving. It should last a couple of days in the fridge. Serve the sushi with soy sauce, pickled ginger and wasabe, if you’ve got it/like it. They also go well with a chilli dipping sauce. I served it as a starter, then followed it with the Hairy Bikers’ Poppy Seed Tempura with Soba noodles. Lovely! Lots of new flavours.